She’s blonde and in many opinions, beautiful, too. She’s one of the most admired singers in Las Vegas. She can sing pop, rock and has a degree from UNLV in jazz studies. She and her husband are also restaurant owners, and she drives her three children to and from school every day. Naomi Mauro leads a very full life. Born in Laguna Beach California and raised in San Clemente, California, Naomi learned to sing at the feet of her Puerto-Rican-born father, Miguel Rodriguez, a jazz guitarist. Miguel and Rachel Rodriguez, Naomi’s parents, are celebrating their 50th wedding anniversary this year. This year, Naomi’s parents will celebrate their 50th wedding anniversary. After high school, Naomi enrolled in the University of California at Irvine to study music and voice. However, within two years, the opportunity for a job got in the way. Naomi and her then boyfriend, a piano player, had formed a duo that was offered work performing in a lounge in Japan. Naomi quit college in favor of the adventure in Japan. 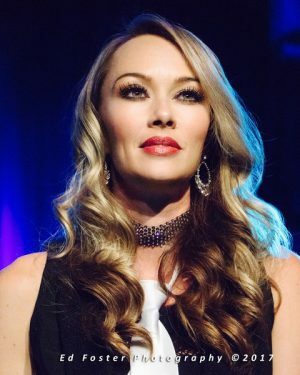 The duo broke up, but Naomi kept working with the help of agent Steve Beyer, She often fronted bands at corporate gigs and then auditioned for a spot with the American Superstars show at the Stratosphere. She was hired as the Stratosphere version of Christina Aguilera. She paid the bills with that job for six years. Naomi and Gio Mauro are seen at their restaurant, Pizzeria Monzu, at Flamingo and Jones in Las Vegas. On Saturday nights, diners can typically hear both Mauros sing at the restaurant; She sings jazz; he will step in with a bit of opera. While she was singing at the Stratosphere, Naomi discovered Nora’s Italian Cuisine on West Flamingo and evenings of jazz with Joe Darro. Naomi would come to the restaurant and sit in with Joe, loving the opportunity to return to her jazz roots. Along the way she became friends with Giovanni “Gio” Mauro, the restaurant’s manager and son of the restaurant’s owners. “We knew each other about a year before we started dating,” Naomi recalled. “The couple dated for two years then married in 2005 and had their first child, Amelia, in 2007. Sons Gino and Evan were born in 2008 and 2013 respectively. Naomi’s singing career was on hold when her children were young, but work intervened in 2011. Gio and Naomi opened the Old School Pizzeria across from the Cannery in North Las Vegas. Naomi was pregnant with her third child when the pizzeria opened, but she pitched in at the new venture as a cashier and, early on, occasional (pregnant) pizza delivery person. Old School Pizzeria is still owned by Gio and Naomi, but they now have other management in place. Amid child-rearing, Naomi took time to return to college. 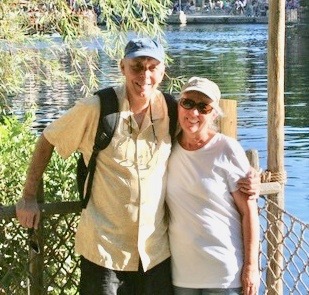 Always regretting never having earned a degree, she enrolled in David Loeb’s jazz program at UNLV. “Jazz students are able to do work in the community and that’s how I got to know the musicians and the other people in town involved in jazz,” she explained. Through her new contacts, Naomi then started getting calls for small jazz-oriented jobs around town. 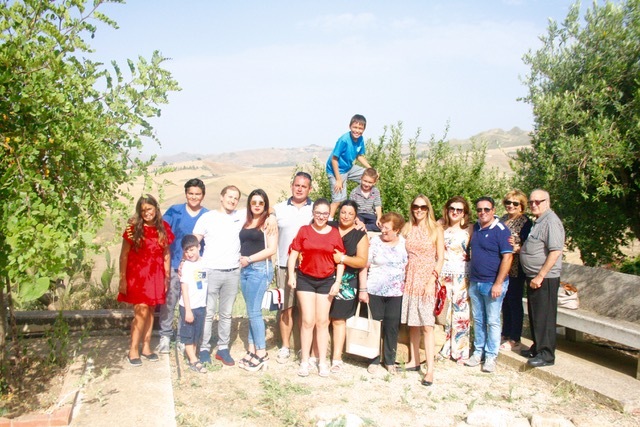 In rare time off, Naomi and Gio Mauro and their children flew to Italy for a family wedding. This photo was taken in Mussomeli, Sicily, Italy. Naomi says classwork reinforced her own view of being a professional singer: keeping your word, showing up prepared, knowing your keys, capable of singing a variety of music and able to conduct the band if necessary. (Naomi can play piano, too.) Naomi graduated from UNLV in 2012. Naomi then sang with numerous groups as the invitations came, from David Perrico & His Pop Evolution Band, the Dispensary Lounge and the Tuscany’s Piazza Lounge, among others. Then came Pizzeria Monzu, a new restaurant owned by Gio and Naomi in the space formerly occupied by Nora’s Italian Cuisine (Nora’s moved to a new location down the street.) Monzu, says Naomi, is Gio’s restaurant dream and the couple’s big gamble, “an expansion of the pizza restaurant into something Gio wanted that was more complete,” says Naomi. 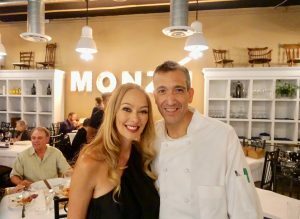 Monzu (the name is a Sicilian word for “chef”) opened to positive reviews earlier this year and, except for a family trip to Italy to attend a wedding, husband and wife have been consumed with work at the restaurant ever since. On weekdays, during the day, after she drops the children off at school, Naomi is at the restaurant. She oversees payroll, licensing, bookkeeping and whatever else needs doing. Gio is the creative chef and manager of employees. Naomi leaves the restaurant mid-afternoon to pick up the children from school and deliver them to any after-school activities. When working, this is the glamorous side of Naomi Mauro. And in the evenings? 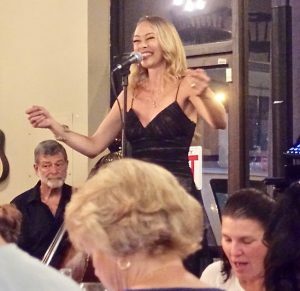 Naomi sings jazz with a guitar trio at Nora’s Italian Cuisine on Friday nights, and she sings jazz with a piano trio at Monzu on Saturday nights. Once a month, she performs in the Rocks Lounge at Red Rock Casino, Resort & Spa, and she performs regularly at The Back Space in Las Vegas. In between are invitations to perform at special one-time concerts or corporate events. Babysitting chores are typically handled by family and friends although daughter Amelia is getting old enough to occasionally join the babysitting team. One of Naomi’s most interesting jobs was a call in 2016 to sing with Celine Dion on a live Facebook event filmed at the Palms studio. Celine’s regular back-up singers were not available, but one of her band members who knew of Naomi recommended her. Naomi harmonized with Celine on Winter Song, and the results have been more than 500,000 views on YouTube. Naomi notes that without her education and her ability to read music, that job might not have been available to her. If Naomi is good enough to sing with Celine Dion, where is her record contract, her TV interviews, her magazine spreads? “I love to sing, but I hate promoting myself,” she says. “It’s probably my biggest fault as an independent musician. My family comes first and whatever work I can pick up in music, that’s what I do.” Naomi has a Facebook page and that’s probably the only place where fans can find out about her appearances other than promotional announcements placed by others. Thank you for sharing Naomi’s story. Now I definitely have to hear her. She’s an incredibly talented musician and her voice is just as beautiful as she is! I loved the article about Naomi. She is truly amazing. Not only is she lovely, but also a very talented performer. Whenever Naomi entertains, it is always a wonderful experience for the listener. Loved the article. Wonderful lady with a beautiful voice!! I loved her performance and can’t wait to get back to see her perform again! !